NOLAsport’s Matt Travis and Jason Hart were never seriously challenged Saturday (March 2) at Circuit of the Americas en route to winning Pirelli GT4 America Race No. 1. 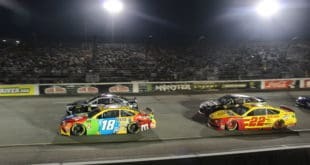 The duo led all but three laps of the 24-lap season opening event. Afterwards, Hart credited his team for the performance. 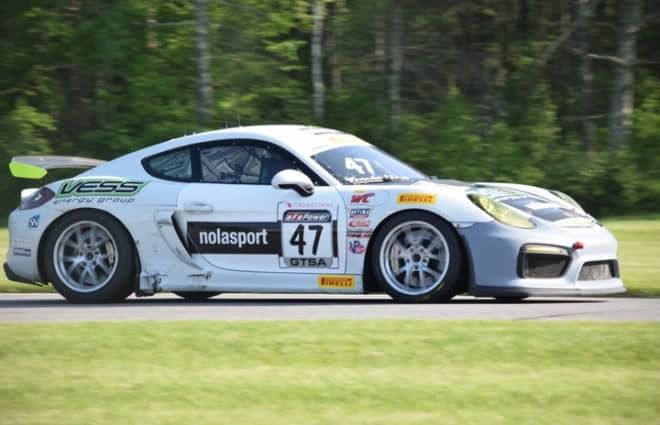 Travis started from pole in his Porsche Cayman GT4 MR (last year’s Cayman pictured above) and spent the early laps having to fight off Jarret Andretti in a McLaren 570S GT4. Over time, Travis was able to open up a small gap. It was during the pit stops where things got spread out. NOLAsport had a great stop for their No. 47. Hart relieved Travis and the team got the car back out quickly. None of the other contenders were able to do so in a quick fashion. As a result, NOLAsport’s lead went from five seconds to 21. Hart was able to expand the lead up to more than 30 seconds when Adam Poland cut his right rear tire and spun in Turn 20. He was unable to resume, bringing out the race’s sole full course caution. Having a 30-second lead meant that Hart had put some lapped cars between himself and Karl Thomson in second. That gave himself a nice cushion. While Thomson ended up in a brisk battle, Hart was able to run away and claim the victory. Travis and Hart’s margin of victory was 8.226 seconds over Park Place Motorsports’ Alan Brynjolfsson and Trent Hindman. RENNtech Motorsports’ Reinhold Renger and Parker Chase were third in their Mercedes, followed by Andretti and Thomson. Or, so they thought. After the race, the No. 36 McLaren of Andretti and Thomson failed post-race inspection badly. The car was found to be underweight by 161 pounds, resulting in one of the more obvious disqualifications in recent years. By virtue of the McLaren DQ, Rearden Racing’s Audi of Vesko Kozarov and Jeff Burton (not to be confused with the Jeff Burton that formerly raced in NASCAR and currently works for NBC Sports) inherited fourth overall. GMG Racing’s Jason Bell and Alec Udell were fifth. In the SprintX Am class, the combination of Andretti and Thomson led flag-to-flag from second overall on the grid. As noted above, they finished fourth before being disqualified due to weight. The disqualification gave the class victory to Team Panoz Racing’s Dr. Preston Calvert and Matthew Keegan, who crossed the finish line in seventh (sixth with the DQ). Their margin of victory was 6.019 seconds over the BMW M4 GT4 of Auto Technic Racing’s John Allen and Kris Wilson. The second NOLAsport Porsche of John Capestro-Dubets and Mike Vess was third. In addition to being the Pirelli GT4 America SprintX opener, the race also served as the season opener for GT4 East and West. The East division attracted the largest entry of the three series. The start was somewhat sketchy as Brynjolfsson was spun out in Turn 1 along with Flying Lizard Motorsports’ Michael Dinan. That dropped Brynjolfsson back to the rear of the field. For the remainder of his time in the car, Brynjolfsson charged back into the top 10 overall before handing off to Hindman. Hindman kept up the pressure, but was way behind in distance. Hindman was fourth overall when the full course yellow came out, allowing him to close up right behind leader Chase. A three-way battle for second overall developed on the restart between Chase, Thomson and Hindman. With two laps to go, Hindman was able to get around both Thomson and Chase with an aggressive move to take second overall. From there, Hindman held on to take the GT4 East Pro-Am win. Hindman and Brynjolfsson were less than half a second in front of Renger and Chase at the finish. KohR Motorsports’s Rich Golinello and Nate Stacy were third in their Ford Mustang GT4. Classic BMW/Fast Track Racing’s Justin Raphael and Stevan McAleer were fourth in their BMW, while Precision Driving’s Marko Radisic and Karl Wittmer were fifth. GT4 East Am saw Bodymotion Racing’s Sean Gibbons and Al Carter claim the class victory in 15th overall. Their margin of victory was 5.823 seconds over BGB Motorsports’ Thomas Collingwood and John Tecce. Epic Motorsports’ BMW for James Clay and Randy Mueller was third. GT4 West was dominated by Rearden Racing’s No. 91 Audi for Kozarov and Burton. Kozarov started the race in the top five and was all over Andretti for second overall early on. Kozarov went to the inside of Andretti in Turn 19 and spun himself out. While he cost himself a bunch of time, Kozarov did not hit anything and did not lose a position. Once back underway, Kozarov ran the fastest overall laps in the race in order to catch back up. That gave the team a big lead when he handed over to Burton. Burton was able to run competitive laps and held up any challengers late to take the win. Kozarov and Burton were entered as an Am class team, yet managed to beat the Pro-Am entries in GT4 West. Their margin of victory was 9.676 seconds in the Am class over The Racers Group’s Kevin Woods and Chris Bellomo. Ian Lacy Racing’s Drew Staveley and Frank Gannett were third. In West Pro-Am, ST Racing’s BMWs were dominant. The No. 28 BMW of Jon Miller and Harry Gottsacker led all but flag-to-flag to win and finish second in GT4 West (11th overall). They finished 2.34 seconds ahead of teammates Samantha Tan and Jason Wolfe. USRD’s Jeff Bader and Casey Dennis were third. Pirelli GT4 America Race No. 2 is scheduled to go green at 11:15 a.m. EST. It will be streamed live at World-Challenge.com. Phil Allaway has three primary roles at Frontstretch. He's the manager of the site's FREE e-mail newsletter that publishes Monday-Friday and occasionally on weekends. He keeps TV broadcasters honest with weekly editions of Couch Potato Tuesday and serves as the site's Sports Car racing editor. Outside of Frontstretch, Phil is the press officer for Lebanon Valley Speedway in West Lebanon, N.Y. He covers all the action on the high-banked dirt track from regular DIRTcar Modified racing to occasional visits from touring series such as Tony Stewart's Arctic Cat All Star Circuit of Champions.